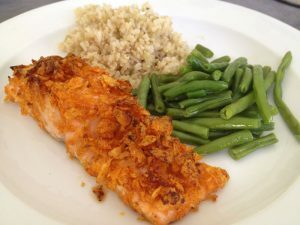 You are here: Home / Recipes / BBQ Kettle Chip-Encrusted Salmon! Let me start by saying this is my favorite, delicious, easiest, any-night-of-the-week meal that requires virtually no cooking talent or experience! Okay, I know what you might be thinking — the dietitian eats potato chips?! The answer is “occasionally” of course! Haha. That’s the R.D. in me talking. The truth is, my husband loves them and so do my boys, so sometimes I just have to buy them, right? The problem is, if I bring those darn mesquite barbeque kettle chips into the house, they don’t last long. I suppose having them in my house at all makes me feel I need to justify their guilty pleasure and presence, and one evening I got this idea … It turned out to be a huge score with both the kids and my husband (and myself!) This has to be the simplest way to get everyone to eat salmon and enjoy it. 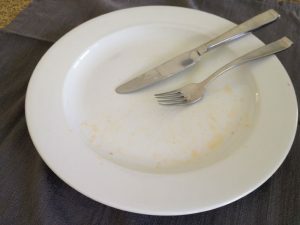 It’s honestly the best feeling when everyone gets up to leave the table, and each carries an empty plate to the sink — not because they were forced to “clean” it, but because they devoured what was on it. So no, I’m not at all embarrassed to admit I buy those oh-so-yummy chips and eat them too, particularly since I came up with what my husband calls the best salmon he’s ever eaten! Wow, that was easy. Why try to impress (him) with a beurre blanc when I can dip some salmon fillets in milk and crushed potato chips?! It should take you 30 minutes from the start to sitting down at the table ready to dig in. Go! 1. Preheat oven to 375 degrees. Rinse salmon, pat dry and then cut into 4 even slices. 2. Pour milk into a shallow dish and chips into a large bowl. Crush the chips with bottom of measuring glass. Alternatively, pour chips into a Ziploc bag, seal and crush, then pour into bowl. 3. Dip each salmon fillet into milk and then into crushed chips, coating the fish but not the skin side. Place fillets on baking tray. Cover with remaining chips if there are any. 4. Bake for 15 minutes. Serve immediately. Note: I find there’s no need for salt or pepper with these. So simple, so good… ENJOY! The BBQ Kettle Chip-Encrusted Salmon is so simple, so good… ENJOY!